Federal Glass Company made Sharon from 1935-39. 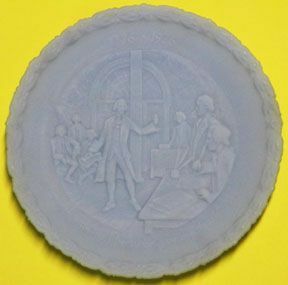 This 6" plate is in excellent condition (only one available). 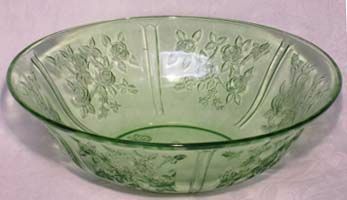 Federal Sharon Green Fruit Bowl, 10"
Federal Sharon (Cabbage Rose) Green Fruit Bowl, 10" in excellent condition. Made from 1935-39. 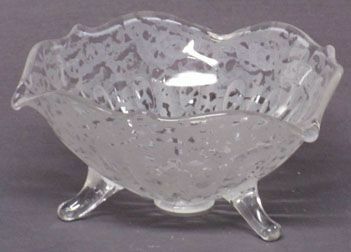 Fenton 6" Ming Etched Bowl was made in the 1930's. It is three-legged. It is in mint condition. 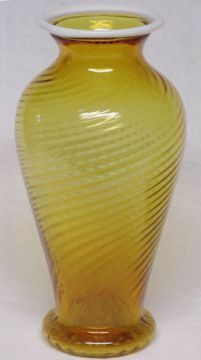 Fenton Amber Snowcrest 10" Vase was made in the mid 1950's with a spiral optic. It is in mint condition. 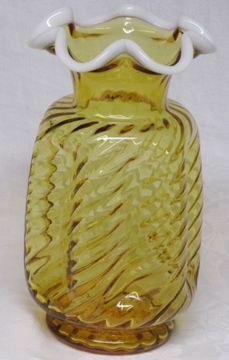 Fenton Amber Snowcrest 7" Vase was made in the mid 1950's with a spiral optic. It is in mint condition. 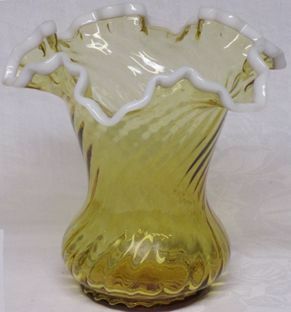 Fenton Amber Snowcrest Pinched 9" Vase was made in the mid 1950's with a spiral optic. It is in mint condition. 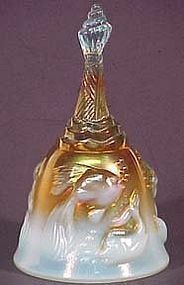 Fenton Amber Snowcrest 9" Vase was made in the 1950's with a spiral optic. This vase is in mint condition. 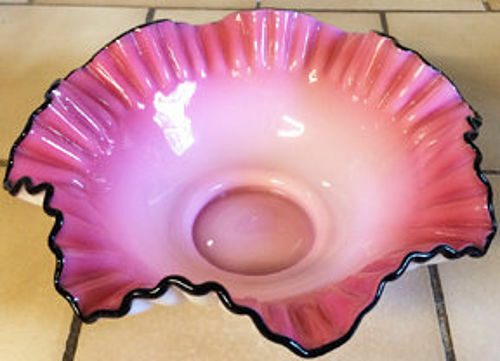 Fenton Apple Blossom Crest Ash Tray, 1960. 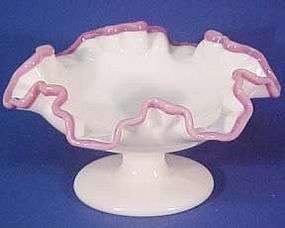 The crest color is made from Fenton's Plum Opalescent formula. They originally only made 12 different pieces. Excellent condition. 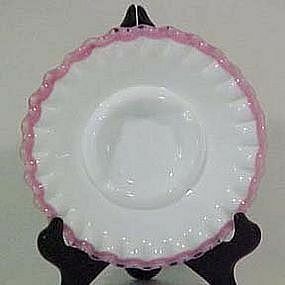 Fenton Apple Blossom Crest Comport, 7"
Fenton made Apple Blossom Crest from 1960-61 -- only two years in production. This footed comport is 7" wide and about 3.5" high. In mint condition. 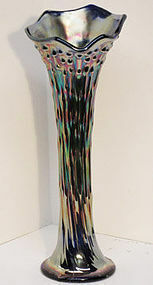 This Fenton Carnival April Showers Vase was made in the 1920's. 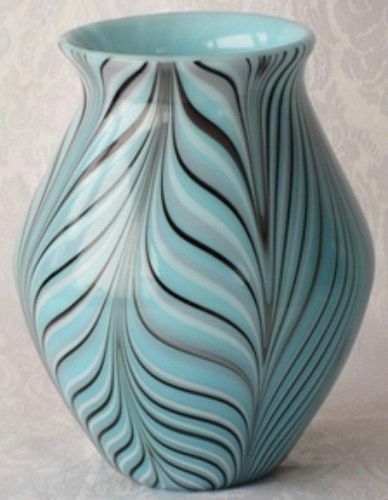 There are other similar vases made by other companies, but this is a Fenton piece. In excellent condition, stands 13" tall. 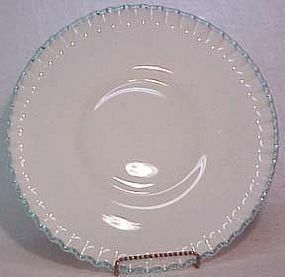 Fenton Aquacrest 11.5" Dinner Plate is in mint condition. (not to be confused with Blue Crest -- a darker blue). 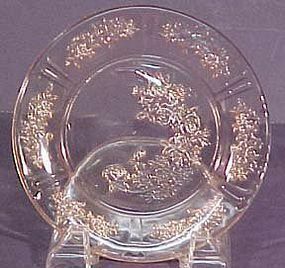 Fenton Aqua Crest 8.25" Plate was produced in the early 1950's. This plate is in excellent condition. Fenton made these Aqua Opalescent Carnival Hobnail Cruets in 1982 -- produced for Levay. Sold as a set of 2 small (5" tall) and 1 larger (6.5" tall) cruet. All in mint condition -- no chips on the stoppers. Fenton made this highly popular bell for it's 100th year (2005). Known as the Atlantis Bell, it still has the original silver label and is in mint condition. Robert Barber was an artist who, in 1975 joined Fenton making a series of art glass pieces. It is number 299/1000, signed DFF (Dave Fetty). It comes with the original literature booklet certifying the artist, # issue, and dated 7/29/75. It is very unusual to find the original certificate. 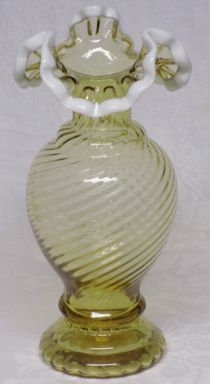 Vase is 8.5" tall and in mint condition. 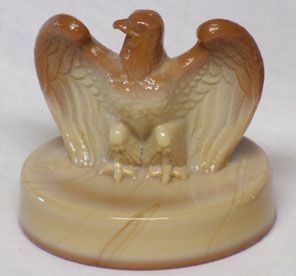 Fenton Bicentennial Eagle Paperweight, Chocolate. Fenton made this in Patriot Red, Liberty Blue and White. They never explained the reason for the color Chocolate -- but we understand the red/white/blue ones. In mint condition about about 4" round and 3.5" tall. Fenton Bicentennial Satin Blue Plate in its original box. Plate is 8.5" across and in mint condition. Made in 1976. Fenton made Black Rose for a little over one year from 1953-54. This 10" Bowl is in mint condition. All of Black Rose is considered rare.